San Francisco, CA – Chinese artist and rights advocate Ai Weiwei will create a new body of site-specific artwork on Alcatraz Island, the notorious former federal penitentiary in the center of San Francisco Bay, now a national park welcoming more than a million visitors annually. Organized by the San Francisco–based nonprofit FOR-SITE Foundation in partnership with the National Park Service and the Golden Gate National Parks Conservancy, @Large: Ai Weiwei on Alcatraz will include a series of large-scale installations occupying several buildings on Alcatraz. Funded entirely through individual and foundation donations, the exhibition will be part of the regular Alcatraz admission ticket and accessible to anyone visiting the island. On view September 27, 2014, through April 26, 2015, @Large: Ai Weiwei on Alcatraz will respond to the island and its layered history as a place of detainment and protest. The exhibition will feature new sculpture, sound, and multimedia works exploring pressing themes that have characterized Ai Weiwei’s art and activism—the right to free expression, the irrepressible nature of creativity, and the role of art, artists, and individuals worldwide in shaping social change. The installations will address these concepts in ways that are both personal to the artist’s experiences and life in China, and resonant with individuals and communities internationally. Responding to the potent history of Alcatraz, the exhibition will examine incarceration as a tool of repressive governments, and creative expression as an act of defiance and individual freedom. Artworks will be installed in four sites throughout Alcatraz. One of the most prominent artists of the 21st century, Ai Weiwei is an architect, sculptor, photographer, filmmaker, curator, writer, and activist whose work often responds to conditions in China, including the government’s repression of free speech and expression. In the spring of 2011, Ai was detained by the Chinese government for 81 days on charges of tax evasion. After being released on bail in 2011, he was prohibited from leaving Beijing without permission for one year. Although Ai has been allowed to leave Beijing since his bail was lifted in 2012, he is still prohibited from traveling outside of China. Ai has developed the overall conceptual direction for this exhibition and the individual works from his studio in Beijing in dialogue with FOR SITE Founder and Executive Director Cheryl Haines, who conceived and will curate @Large: Ai Weiwei on Alcatraz. Because the artist is currently unable to visit Alcatraz, Haines has made numerous trips to Ai’s studio in Beijing to deliver in-depth information about the site, including maps, archival materials, photographs, and video footage conveying the history of Alcatraz and the particular spaces where the work will be installed. Continuing a strategy regularly employed by the artist, the artworks themselves will be fabricated by others: studio assistants, classical Chinese craftsmen, and volunteer citizens, adding a participatory element to the project that is characteristic of Ai’s work. Consistent with the artist’s active use of the Internet to inspire communication and collective action, @Large: Ai Weiwei on Alcatraz will include opportunities for visitors to engage with the show’s content using social media. Beyond its legacy as a world-famous former federal penitentiary (1934–63) that once held notorious criminals like gangster Al Capone, Alcatraz has undergone numerous incarnations that have contributed to its unique and deeply layered history. First inhabited by native peoples 20,000 years ago, the island was recognized for its strategic value as a military fortress in the Civil War era, and later catalyzed the Native American Red Power movement with the revolutionary 18-month occupation by the Indians of All Tribes from 1969 to 1971. Today, it stands as one of the country’s most popular national park sites and visitor destinations, attracting more than 1.4 million people each year. The island is also the site of the West Coast’s first lighthouse (since replaced by the current lighthouse) and home to gardens, tide pools, nesting birds, and unrivaled views of the San Francisco Bay. Established in 2003 by Cheryl Haines, the FOR-SITE Foundation is dedicated to the creation, understanding, and presentation of art about place through commissions, artist residencies, and educational programs. Since 2008, FOR-SITE has broken new ground and provided a model for engaging the public through artistic collaborations on national park land. 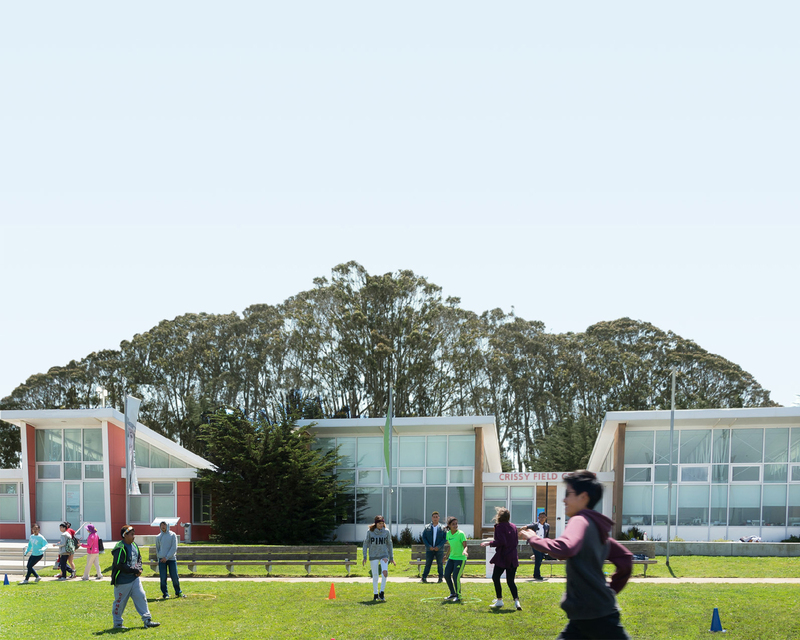 FOR-SITE’s recent projects include International Orange, a group show at Fort Point featuring work by leading contemporary artists to mark the 75th anniversary of the Golden Gate Bridge; Andy Goldsworthy’s installations in the Presidio of San Francisco, Tree Fall (2013), Wood Line (2011), and Spire (2008); and the acclaimed Presidio Habitats exhibition, for which artists and designers including Ai Weiwei, Mark Dion, and Don Chadwick created animal habitats throughout the park. Funding for @Large: Ai Weiwei on Alcatraz, and for all of FOR SITE’s projects, comes from individual donors to the foundation. The National Park Service (NPS) is a federal agency within the US Department of the Interior charged with managing the preservation and public use of America’s most significant natural, scenic, historic, and cultural treasures. The NPS manages the Golden Gate National Parks, as well as 400 other park sites across the United States. For more information, visit www.nps.gov/goga. The Parks Conservancy is the nonprofit membership organization created to preserve the Golden Gate National Parks, enhance the experiences of park visitors, and build a community dedicated to conserving the parks for the future. The Conservancy is an authorized “cooperating association” of the National Park Service, and is one of more than 70 such nonprofit organizations working with national parks around the country. To learn more, please visit www.parksconservancy.org. @Large: Ai Weiwei on Alcatraz will offer interpretive materials and resources for the general public and for schoolchildren, including a visitor guide and map as well as program-related activities, talks, and public tours. Alcatraz is open every day of the year except Thanksgiving, Christmas, and New Year’s Day. Visitors are encouraged to buy tickets well in advance, especially during peak summer season. For schedules, prices, and to purchase tickets, the public can call 415.981.7625 or visit the Alcatraz Cruises. website at www.alcatrazcruises.com. For more information, visit the FOR-SITE Foundation website at www.for-site.org or call 415.362.9330.